Do I need special paper for my tags? Yes. You must use white cardstock for items that you DO NOT wish to be donated. Orange cardstock must be used for items that you DO want to donate if not sold. The cardstock needs to be >60lb sheets. We will have this available for purchase (10 cents per sheet) in our church office the month prior to the sale. How do I print my tags? After entering your items, click on the tab that says “Print Tags”. You can select all or a few of your tags to generate. Once you select the items, click on “Generate Tags”. This will bring up a pdf file with 8 tags per page. The file will automatically print in the landscape format, do not adjust your settings. Printer should be set at “normal”, not “best” or “draft.” If the ink is too dark or too light, the tags will not scan. You can test scan your own tags with any scanning app on your smart phone, even your Target Cartwheel app! You are looking for the bar code to scan and show an error, doing nothing may mean your tags aren’t legible. How do I prepare my items for tagging? -All clothing items and accessories must be hung on hangers. This includes swimsuits, pajamas, and costumes. 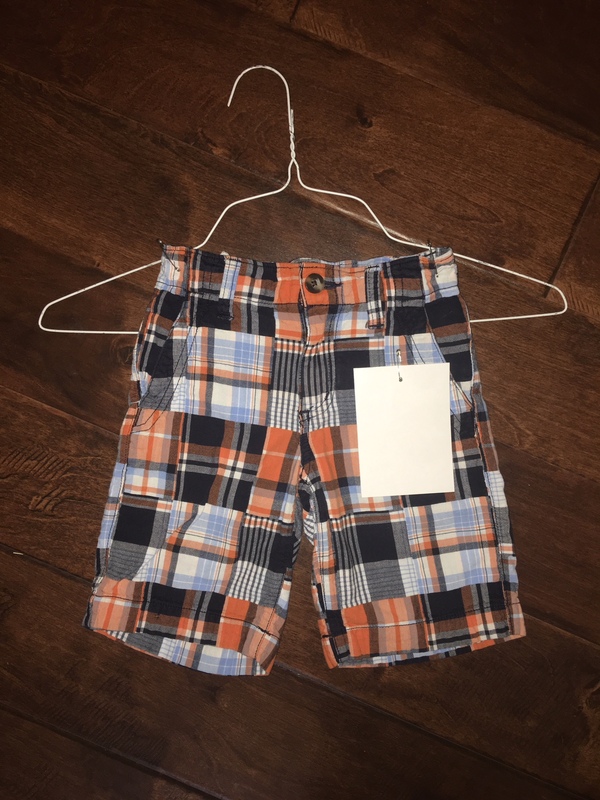 Attach shorts, pants, and skirts to a hanger with safety pins. -Matching sets must be the same size. No Size 3 top with a Size 2 bottom. -Clothes sell better when they are in very good condition, washed, and ironed. Inspect all items for stains, broken zippers, excessive wear and torn hemlines. We cannot accept soiled, stained or damaged items. -Shoes (limit of 10 per consignor) must be clean and placed in a Ziploc bag or secured together with zip ties. Loose shoes will not be accepted. -All electronics must work properly and have working batteries. Charge all ride-on and motorized toys and secure charger to the item. Buyers will want to see your toy works wonderfully. We cannot accept ride-ons that are not charged at drop-off. -If your item has small parts or chargers, place them in a Ziploc bag and securely tape them to the item. This is to prevent parts from getting lost or stolen. -DVDs should be in their matching case. How do I hang my clothes? While facing the item, the hanger should make a question mark. (?) You may need to use safety pins to secure your item to the hanger. 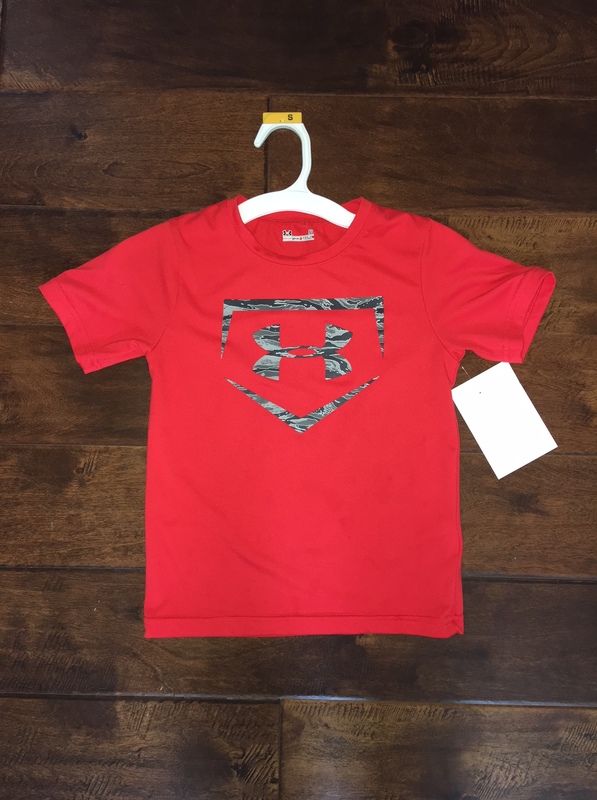 More than one item can be hung on one hanger, especially when selling sets. 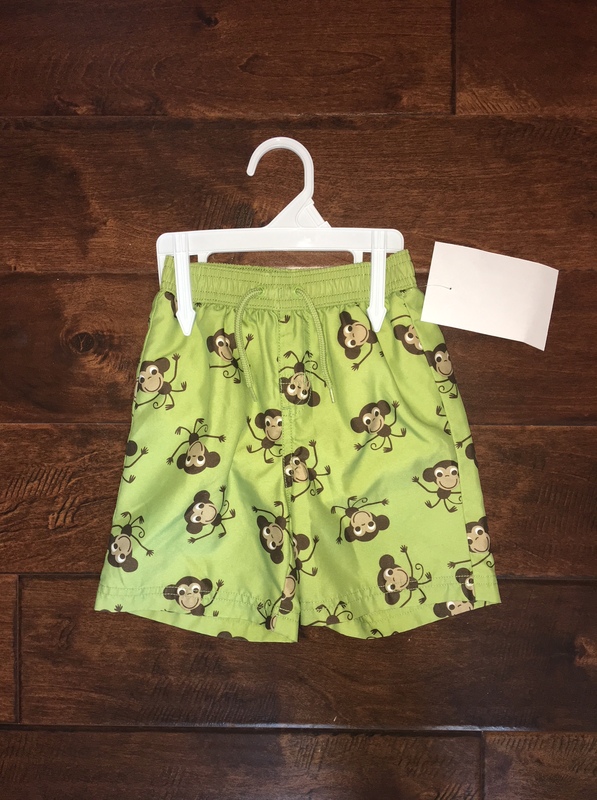 You may safety pin 2-3 pajamas, shirts, or pairs of shorts and pants together on one hanger. This allows you to sell more items for a higher price! 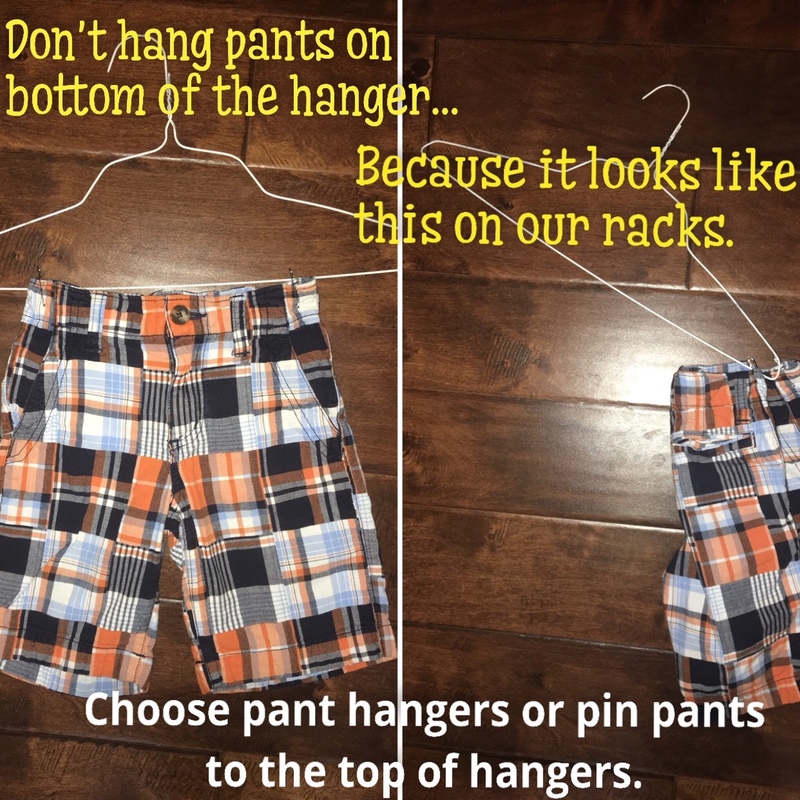 If pant hangers are not available to you, pants may be secured to the TOP of the hanger by safety pins only. Be sure to NOT secure pants with the tagging gun ties or hang pants to the bottom of a shirt as both will create holes. Pants pinned to the bottom of the hanger slide around and do not show or sell well. **Please note- Clothing Size 5T/5 and up MUST be on ADULT-sized hangers, no child size hangers allowed for these sizes. We will not accept any items not properly hung because they fall off the hangers too easily. Clothes on the floor don’t sell and get damaged. The better the sales floor and items look, the more we can sell for you! Hangers should not be bent or altered. We will ask you to pull aside and correct any items at drop-off that are not hung as instructed, or these items will be pulled from our racks. 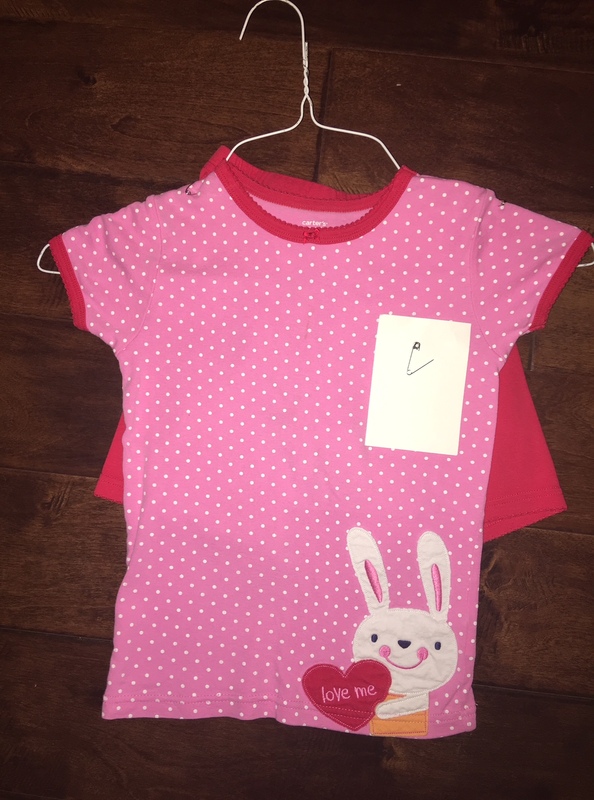 How do I attach my tags to clothing? Please follow these instructions carefully and tag your items very carefully. Tags may be attached using a tagging gun or safety pins. Please be careful to not damage your item when tagging it. Tags should be on the upper right of the garment when looking at the item. 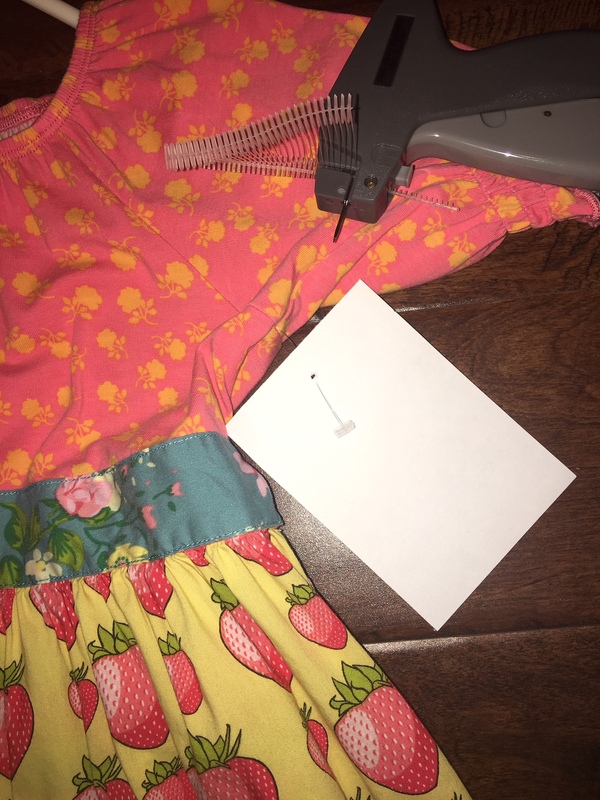 (left chest area of the garment) If using a tagging gun- you may only insert the needle of the tagging gun through the garment’s tag or through a seam in the item’s left armpit. 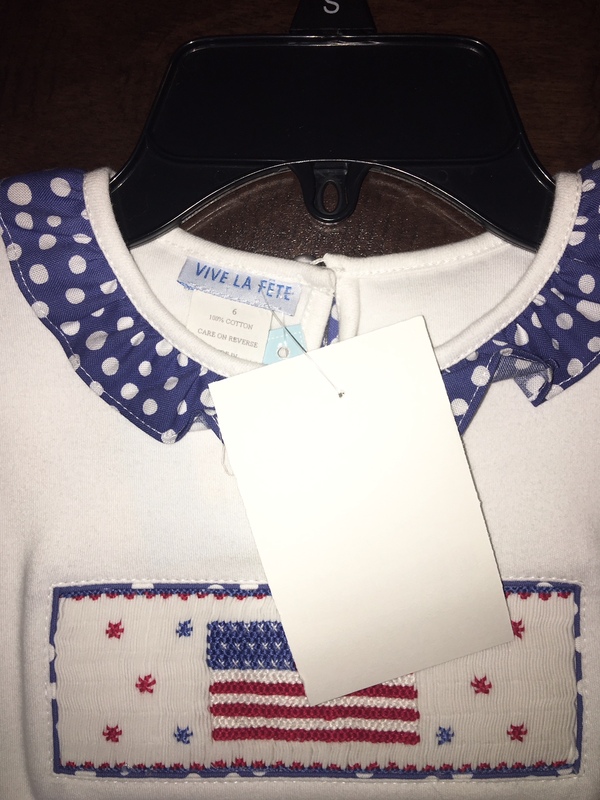 (If it is a boutique item, you may also put the sales tag in the back tag of the garment.) Please be careful to be in the seam or tag only. 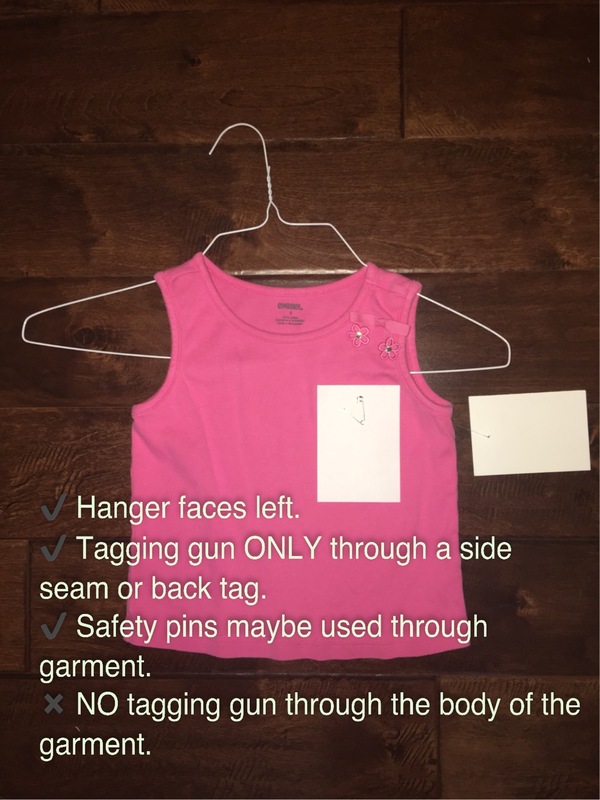 Do not use a tagging gun through the body of the garment- this will damage it and creates a hole. We cannot accept items damaged from tagging guns. Safety pins only may be used through the body of the garment. Please visit our Instagram for additional examples or email us with any questions. We reserve the right to turn away clothing not tagged correctly or pull it from the racks. No straight pins are allowed, no exceptions. Please do NOT use packaging tape over your safety pins at the tag; it is very hard to later get the tags off per shopper feedback. The safety pin is sufficient. If you are using a tagging gun, we recommend a thicker fastener (the plastic string that holds the tag.) The very thin ones we find break off easier and are the majority of our lost tags. How do I attach my tag to toys/equipment? We recommend securely taping your tag to the item with clear packing tape or masking tape being careful that removing the tape will not damage the item. Masking tape is great on books and usually not as damaging when removed. Do NOT place your tag inside a bag. Do not place tape over the barcode. Your item will not scan if this happens. At checkout we cut off the the bottom half of the tag with the barcode to scan. Keep tape well above the barcode. Accessing tags that are inside bags or taped too heavily greatly slows down our check out lines which deters shoppers, please be mindful of this. How do I tag my shoes? Securely tape the tag on the outside of the bag with clear packing tape. Do not place the tag inside the bag. If you are zip tying your shoes together, zip tie the tag also or use a safety pin to attach the tag to the zip tie. IMPORTANT! Items without a tag or missing a tag will NOT be sold. 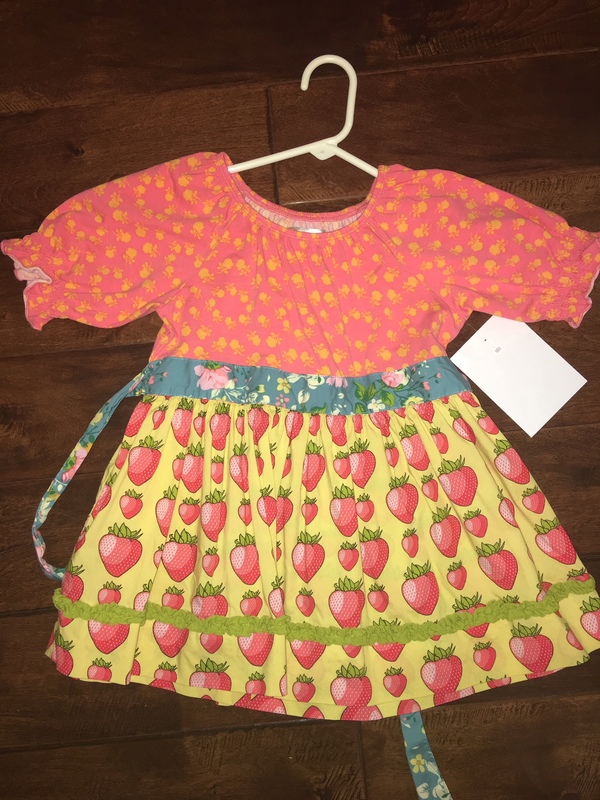 Weddington Kids Consignment volunteers, the Susanna Wesley Circle, Weddington UMC, and its affiliates are not responsible for items or payment for items that are not tagged/packaged correctly. All items without a tag will be placed in the lobby at pick up on Saturday. Please check this table for any of your items.